namaḥ (n/V) – adoration, homage; sura – a god, divinity, deity; gaṇa – troop, crowd, host, tribe, suit, retinue, flock; adhyakṣa – eye-witness or superintendent; kinara – [horse-headed men?] sevite (f/V) – dwelt in, visited, frequented, followed, served, furnished or endowed with, abounding in; ābaddha – tied on, bound [but here = rakṣā-cakra protective circle; tib. kun nas bskor completely circumbulating]; mudita – delighted, joyful, glad, rejoicing; ābhoga – winding, curving, curve, crease; kali – the One-side of a die, the last and worst of the 4 ages of the world, strife, discord, quarrel, contention; duḥsvapna – a bad dream; nāśini (f/V) – perishing, perishable, [ifc] destroying, removing. Minor gods, and kinaras rely. Dispels all disputes and bad dreams. The nineteenth is homage to Mipham Gyalmo,Tib the “Undefeated Queen”, who averts conflicts and bad dreams. She is white and holds a white umbrella. Indra, Brahma, gods of the desire and form realms, demons and local gods who harm beings, and the gods of mountains, lakes and trees who help beings, honor her without exception. In general, by the mantra that is blessed by her and the visualization of her body as armor, all conflicts and bad dreams can be averted. In particular, the multi-colored vajras and the sparkles they emit avert religious and political critics, and make their statements powerless. She wears a crown to symbolize honoring lamas as deities, actualization of primordial wisdom, and stabilization of bodhicitta. She wears earrings as a sign of refraining from the humiliation of lamas. Her armlets, bracelets, and anklets, six in number, signify that she refrains from killing insects. Her necklaces represent her perfect recitation of mantra. Her belt, lower garments and ornaments indicate that her body is endowed with bodhicitta. All of her ornaments are like fine armor, whose splendor can avert criticism and the bad dreams caused by the imbalance of the winds (prāṇa), channels (nāḍī ) and seminal essence (bindu)1. The inner meaning is that by having the karmic wind2 flow into the central channel, dbu ma Tib, avadhūtī Skr, the experience of the armor of emptiness is actualized, averting the delusions that cause conflict and bad dreams. 1 winds (prāṇā skt), channels (nāḍī skt) and seminal essence (bindu skt) ~ Our vital energy or wind, moves the essential fluid of consciousness or seminal essence, also called tigle or drop, through the channels, or in Sanskrit, nāḍīs. 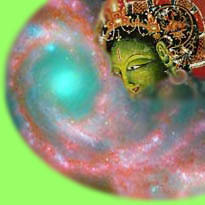 2 karmic wind ~ The vital energy generated by our karma.